We continue to be fascinated by animals, especially when they exhibit smart behaviour. When this behaviour is used to outsmart humans, however, we are not as impressed. We go to great lengths to protect our properties as well as our homes and do not appreciate wildlife invasions. The experts at Raider Wildlife Control have experience with crafty creatures and want to share some of our wisdom so you know what you are up against the next time you encounter these ‘dumb’ creatures. 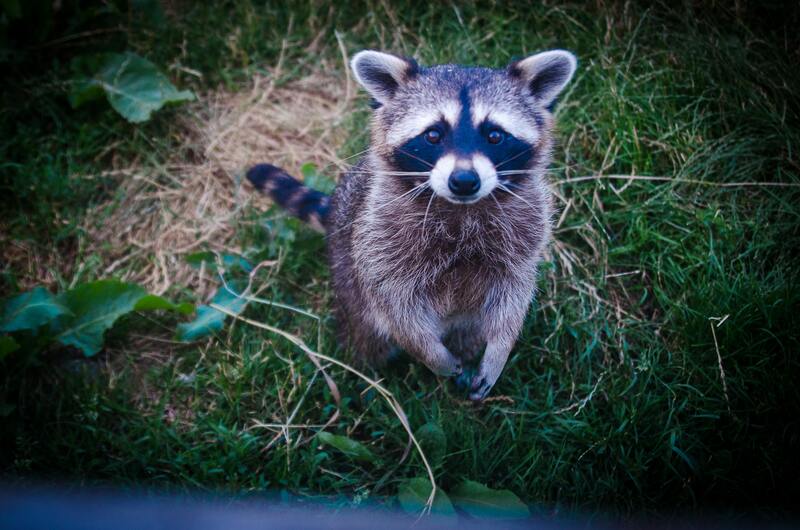 Raccoons are known to be intelligent creatures, but do you know why? Firstly, they are one of the few creatures with dexterous hands. In fact, the English word ‘raccoon’ derives from the Native American Powhatan word ‘aroughcun,’ which means ‘animal that scratches with its hands.’ Raccoons begin their lives with useful tools, so it is logical that they would figure out ways in which to use them, particularly when it comes to amassing food. Surprisingly, their front paws have four times as many sensory receptors compared to their back paws. These receptors help them see their food better and are useful in the dark. When raccoons add water to their hands, the nerve endings are stimulated and provide more information than they would if their hands were dry. Secondly, the black fur under their eyes that gives them their signature thief look is a way of protection. The dark colour absorbs light, allowing them to see more clearly. Raccoons are more active during the night because of this handy tool that provides them with the ability to perceive contrasts. Athletes have adopted this tool for the same reasons. Raccoons are adaptive creatures, much like humans. This skill allows them to survive and even thrive in rural, urban, and suburban areas. Although they eat insects, fruits, nuts, and seeds, they rummage through peoples’ garbage. As raccoons spend more and more time in human-populated areas, they are improving their problem-solving skills as humans try to outsmart these crafty creatures. Canada is home to 22 species of squirrel, six of which are tree-dwelling. Every province and territory has at least one type. The grey squirrel is found in New Brunswick, Quebec, Ontario, Manitoba, as well as Saskatchewan, with the red squirrel being present in many of the same places in addition to British Columbia, Alberta, and Newfoundland. A squirrel’s tail is used in different ways, from displaying their mood to providing warmth to helping them balance at great heights. According to National Geographic, the grey squirrel is more success at problem-solving than red squirrels. Both types of squirrels were given an easy and challenging test by a squirrel behaviour expert. Both were able to solve the first test, which consisted of opening a clear plastic flap to reach the planted food. But, the challenging test had more steps involved and was completed by only 68% of the red squirrels while 91% of the grey squirrels were successful. Both tests demonstrated that grey squirrels change tactics when they are presented with a task. Although both types of squirrels are good at finding food, the grey squirrel proves to be more flexible. Consequently, the red squirrel population in Europe is decreasing in the presence of its competitor: the invasive grey squirrel. Now you may know how and why these pests get onto your property and into your home, but it is still a smart move to call the experts when you encounter wildlife in your walls, in your attic, and any other place they shouldn’t be. At Raider Wildlife Control, we employ humane removal strategies and secure potential entry points to ensure your home is protected from wildlife invasions. We serve the Ontario area, so call us today at 1-844-482-7243, or send us a request to find out how we can help you!